It is not merely one time of the year when we struggle hard to get rid of the skin problems. The uncomfortable dryness resulting flaking, acne problem, eczema and many more complications exert and grasp many. Usually, our homes are stocked with various home remedies and these awesome natural therapies significantly work for our beauty concerns. One of the most effective natural ingredients is tea-tree extracts. The oil is derived from the distillation of the leaves of the tea tree. This oil is famous with the name of 'Medicine in a bottle'. Tea tree oil is a great remedy for acne, blemishes and dark spots. As it contains anti-fungal and anti-viral benefits, it heals the skin, maintaining skin health and leaving a rosy glow. A good cure for dry skin, regular usage of tea tree oil keeps the skin hydrated. You feel a soft, glowing and supple skin. There are several products available over the counter like creams, face washes and face packs of tea tree extracts. Using these products frequently cures acne. Some studies also show that tea tree oil is as effective as benzoyl peroxide (medication to treat mild to moderate acne problem). As already mentioned that tea tree oil contains anti-fungal and anti-viral properties, it is a good source to heal wounds and ringworms and treat warts and corns. Apart from maintaining skin health, diluted tea tree oil also has various medicinal usage. 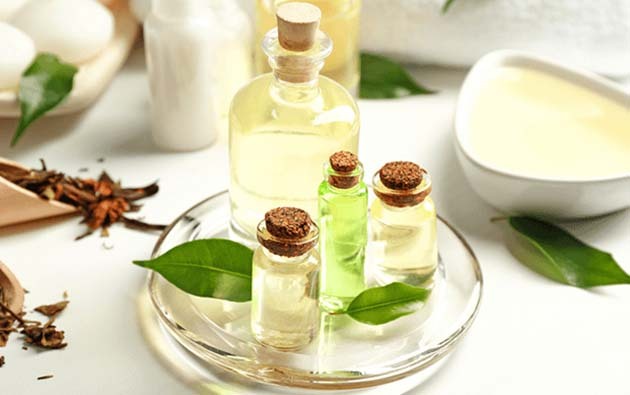 Applying tea tree oil on cuts, burns, insect bites and rashes soothes and heals them naturally. It also relieves skin rashes and helps in removing skin tags. It acts as a great antiseptic for the cuts and the burns. Razor burns can be quite hurting if not treated aptly. Dilute the tea tree oil in water and dab a few drops on a piece of cotton and apply it after shaving, for a soothing effect. Tea tree oil is beneficial when diluted in the water, as direct usage on the skin may cause some side effects.